Are you planning to try out online dating sites but you’re scared that you might be putting your Christian values to the test? Is this the reason why you are at this Christian Mingle review? Well, you came to the right place because I will be reviewing Christian Mingle for you. With today’s innovative technology, it is no doubt that everything that been evolving. This, of course, includes the way people are dating. Gone are the days where people get to date the ones that were introduced to them by their family and friends. Today, they can get their own date just by joining online dating sites. One of the niches that has been getting a lot of attention is Christian dating sites. This is mainly because of the many Christian people who want to join online dating sites without compromising their values. One of the many Christian dating sites is Christian Mingle. Get to know this online dating site before you start hitting that sign up button. One of the leading Christian dating sites today is Christian Mingle, which are catered for both men and women. People here always want God to be the center of their relationship. One of the things that sets them apart from everyone is that their members always make quality connections. They have personal features and robust profiles to assist their members connect with members who are likeminded. Christian Mingle is quipped with communication tools, which will help members to ensure that they will be able to meet people and create a deeper connection. This is one of the many reasons why a lot of Christian singles are turning to Christian Mingle to help them find their perfect match. The members on Christian Mingle are usually a very diverse group who are looking for a meaningful and long relationships. They are not that religious but they sure know how to value their faith and as well as appreciate their match. There are more women than men on the site, so if you are a guy, then this is definitely good for you. Majority of the members on Christian Mingles are looking for both companionship and friendship. Just in case you are wondering, Christian Mingle serves singles who are straight. This is one of the mot unique feature of Christian Mingle. The Readiness IQ Test will help you know if you are already ready to date and be in a relationship again. The results will be in private and will only be shown to you for your own learning process. This feature is quite helpful, as this will help you know if you are ready or not. Christian Mingle also has Compass matching test, which will help you find great matches for you based on the personality test that you have answered. This kind of test is a multiple choice one, which will help reveal certain aspects of your personality. The first thing that you need to do when creating an account on Christian Mingle is your email address. You can either create a new email or use your personal email address. 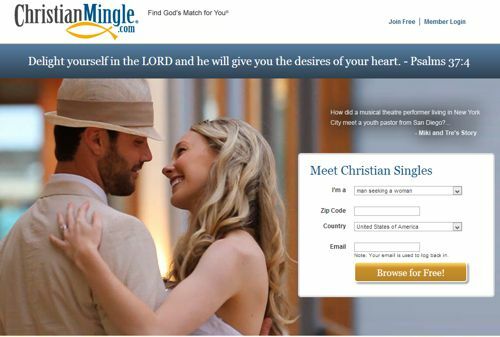 Once done, you can start filling up all the needed information on Christian Mingle, including your photos. You can at least upload one photo so you can continue with the processing of your profile. When choosing your photo, it would be best to choose the best photo that you have. The reason behind this is because women here are always serious in looking for a relationship. So if you want to get noticed, then choosing a presentable photo of yourself would be best. According to research, an expansive posture will make you look attractive to a lot of women. Once you are done with the email and done uploading your photo, the next thing that you need to do is to choose a username. You have the option to use your first name or you can use a word that you like. Once done, you will be prompted to answer a number of questions. The question will usually be about occupation, church affiliation, and as well as your martial status. You will also be asked if you want have kids so you better answer that as well. Another thing that will be included in your profile is a section where you can write something about yourself. Always make sure that your first sentence will be attention grabbing so make sure to think about what you’re going to write. Write a good picture of how your daily life is going through. Use words that are descriptive and vivid imagery. Write something about you and write something about the woman that you want to meet. Avoid writing something senseless, if you want to skip it, then your chances of meeting someone will be low. Don’t forget to proofread as poor grammar and misspelled words are turn offs. Now, after writing your profile, then next thing that you need to do is choose the activities and interests that you like. It would be best to choose a few activities and interests, as these things will help other members to get to know you. For people who don’t know, once a woman sees that you have a shared interest, it will automatically catch her attention. Also, this can help you create a connection almost instantly, which you can use as an icebreaker when you send her a message. You also need to filter your matches so you will only be contacted by people that you may like and the same goes with you. Some of the most basic criteria would be type of relationship, religion, distance, and age rage. You may also set the preferences to a more specific trait, including your drinking habits, church attendance, education level, and as well as height. It would also be best to not be too picky, as this will only reduce your chances of meeting someone on Christian mingle. Yes, most especially if you are someone who lives in a remote area. Searching for members on Christian Mingle is pretty easy. You can search for members based on lifestyle and appearances. You can also search the members who are currently online so you can message them. But remember that messaging them means you need to have a premium membership. Christian Mingle has different ways on how they can initiate a contact or communicate with other members. You have the ability to see who viewed you or who sent you an icebreaker. But, for you to be able to respond, then you need to a paid subscription as mentioned above. Now, once you have found a member that you want to communicate with, you can send them an E-card, a spark, or a smile just so they know that you are interested with them. Another thing that you can do is to let them know that you are a secret admirer so you can see if they are interested with you as well. Of course, if you prefer having an intimate conversation, you may do so by email or instant messaging. These are all of the information that you need to know about Christian Mingle. With this Christian Mingle review, you surely know now what to expect once you hit that sign up button.